FugginSuggin.com: UPDATED - China Puts Dalai Lama In Middle of Riff With U.S. UPDATED - China Puts Dalai Lama In Middle of Riff With U.S. Early today, a senior Chinese official cautioned U.S. leaders that meeting with the Dalai Lama would further harm the already tumultuous relationship. The Dalai Lama is set to visit the United States in coming months, and this outright warning by China is directed to a once-rumored meeting between the Tibetan monk and President Obama. 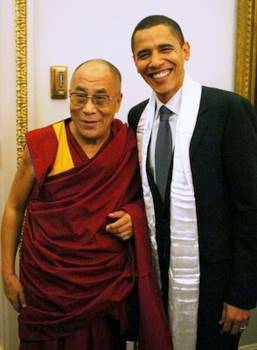 A Whitehouse Aide has recently confirmed the meeting and stated that President Obama still plans to meet with the Dalai Lama, despite China's warning. The Chinese central government and representatives of the Dalai Lama recently had unproductive talks regarding the Dalai Lama's longtime and outspoken support of Tibetan autonomy.